Pitmaster Mike Pagel of the Cool Grilling BBQ Team is trying to give me another rib. I'm stuffed I protest. Now you know what it feels like to be a judge, he laughs. Indeed, I have an idea. Pitmaster Mike Pagel of the Cool Grilling BBQ Team is trying to give me another rib. I'm stuffed I protest. Now you know what it feels like to be a judge, he laughs. Indeed, I have an idea. The 5th annual West Coast BBQ Classic celebrated all flavor and style of BBQ at the Queen Mary in Long Beach California this past Saturday, May 14. Memphis, North Carolina, Kansas City, and Texas style flavor profiles and grilling techniques were in abundance. The secret, Mike Pagel tells me, is not to burn the judge's mouth. Their sweet almost syrupy sauce hits the mouth with a burst of honey citrus sweetness but follows up with a black pepper back end. Truly delicious. I watch as he and Second in Command Fred Pland, a retired firefighter, carefully plate their entry for the judge's tent. More entries follow, ribs that fall off the bone and brisket with a smoky sweetness that melts in the mouth. The line for Outta Gas BBQ winds up and around the pathway. As you wait, attendants offer fresh watermelon slices. Worth the line, the ribs are a savory blend of spice and sweet reflecting the garlic, salt and pepper flavors that make up the base of Chef Andes' signature style. Two suited gentleman guard the enormous trophy outside the tent, a well deserved win for a team that has developed a reputation for excellence. Smaller booths kept the competition stiff, however. The family run operation Q'ued Up BBQ featured pulled pork that would make Memphis proud. Smokey hickory sweetness accented with caramel overtones make the sandwich bun a moot point. 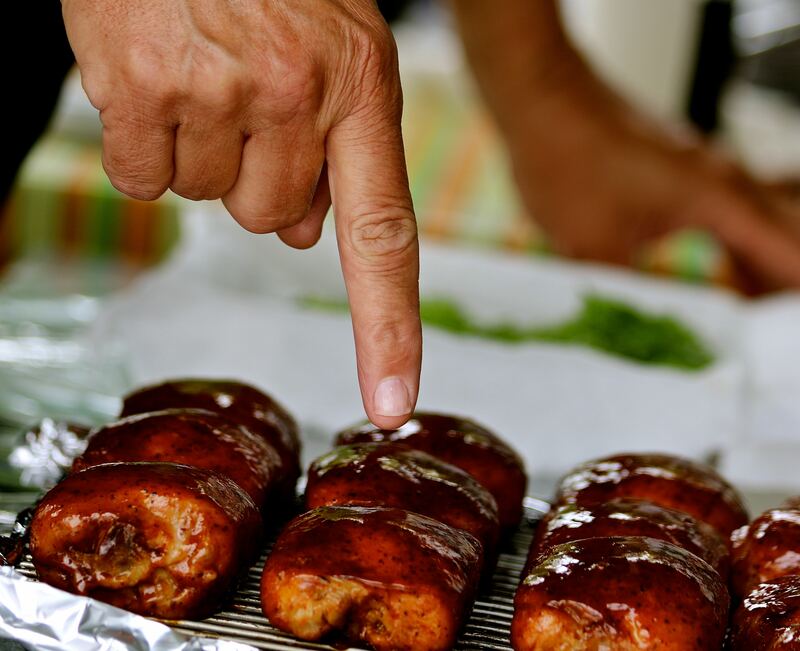 Q'ued Up BBQ has been at the West Coast BBQ Classic since the start and compete in many other festivals in the southern California area. It's not all about the food though; the music courtesy of The Scotty Mac Band would have been reason enough to enjoy the day. Based in Southern California, the country group borrows influences from Garth Brooks and Fleetwood Mac resulting in an old school country rock feel that suited the laid back vibe to a tee. Cold beer, lemonade, ice cream and games for kids and adults alike combined to create a happy, and very full crowd. Check out the slide show below for more delicious photos from the day!